Here is a first look of Wessex new TE564 compensated Eb tuba ‘Cavalry’. 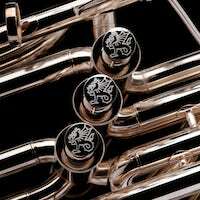 The name comes from the fact that it is based on the classic British cavalry tuba of the early 20th century recreated with 4 forward facing compensated valves (0.69” to 0.73” bore) and 19” bell. People will say it looks like the 983 from a well know brand, because that is also based on the same cavalry tuba design - but with the new Wessex we have tried to make more open wrap with less bends, in much the same way we did for the EP104 Festivo euphonium. Just look at the 3rd valve loop as an easy to see example. As a result this plays amazingly open for a compensated tuba, with the large 19” bell giving a rich full tone. This tuba will be available to play test at US Army workshop at Washington DC and TMEA during February. It is shown at the Butlins Mineworkers brass band contest (UK) where we exhibited it for the first time last weekend. Mark Finley wrote: Can't wait to try it! Is this the "monster Eb" you previously mentioned for 2018? LCH3 wrote: Is this the "monster Eb" you previously mentioned for 2018? Beautiful! Let us know when you have someone record a demo on YouTube!